Book 14 in the Dragon Guard series. The books can be read as stand-alone stories, but it is advisable to read them in order to get the most enjoyment from the series. 5.0 out of 5 starsWhat to say about this book! Poor Kellan has suffered due to a past horror but once again the universe does not make mistakes and sends the perfect woman as his mate. Olive was wonderful, she is one of the new avian shifters we met in the last book and even though she is a Dove shifter she takes no guff from Kellan when he acts stupid. A very strong loving capable woman who manages to bring Kellan back from his dark past and to be the Commander he once was. Lots of action with the dragons, panthers and avian shifters attacking a lab that is torturing and experimenting on shifters. I wanted to cry along with Olive at what was done there. Was not keen on the storyline of shifters being used as scientific experiments as it has been done too many times before but the fact it all ties in with the hunters made works well and makes sense. Loved what happen to O’Baoill, but I think he got off lightly. We also have a mystery dragonguard shifter turn up and an exciting end which starts of the Mad Dragons book which is next. Couldn't wait to read Kellan's story. The dragon guard with the scar. A mysterious protector who carries a heavy burden. Olive - a sassy dove shifter who only wants to be by his side and help him shed the darkness surrounding his thoughts. I enjoyed the build up with the war against the hunters, the endless support Olive carried for Kellan and the acceptance he eventually lets in. It made for a beautiful read. 5.0 out of 5 starsCan this series get any better!? I really enjoy the interaction between characters - especially between the Hero & Heroine. There are some great lines, and some really hot scenes. The characters are flawed and have to overcome some pretty tough issues to come out the other side. This series has really grown on me. 4.0 out of 5 starsAnother good one from Julia! I received a free copy for my honest opinion. This is the 14th book in the Dragon Guard Series and tells the story of Kellen and Olive. 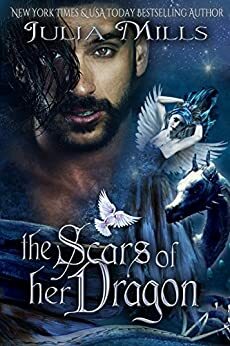 Kellen is trying to deal with the nightmares from his past as the anniversary of the incident where he received his scars is nearing. He tries to "shut" her out but Olive is not having any of that. Together with the help of his guardsmen, Olive's cousins, and the shifter clan, he can finally put that night to rest and quiet his demons. This has suspense, mystery, romance, and wise crackin' dragons. What's not to like? This can be read as a standalone story with a HEA, but to fully enjoy the series, the other books should be read first. I enjoyed this story and recommend it! I loved this book. It was interesting and kept me entertained from start to finish. I could not put the book down. I loved how the author was able to keep my attention for the entire story. I just wish there was n=more to it. I ran out way too soon. I am waiting very impatiently for the next story in this series.